Nokia N9 users, it looks like you have not been forgotten after all. The MeeGo PR1.3 update should be coming to your handset pretty soon bringing "over 1,000 quality improvements" across various bits of the platform. 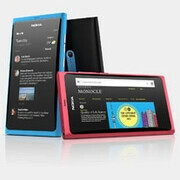 Those who own an unbranded Nokia N9 will see the update first, and the branded models will follow afterwards. All in all, the update should reach your handsets no later than a few weeks from today. So, what's on that list of 1,000 improvements we just mentioned? Well, most of the stuff are bug fixes and stability improvements, which you might not even notice during every-day use, yet some other changes you are much more likely to spot. With MeeGo PR1.3, the Nokia N9 connects faster to Wi-Fi and manages to focus better on objects when shooting photos in low-light conditions. The Mail, Facebook, and Twitter apps have also been improved. In addition, you might notice that NFC now works better, and that a few interface tweaks have been added here and there. You can either wait for an update notification to appear on your Nokia N9, or in case you prefer to check manually, go to Settings, then tap Applications, and then go to Manage Applications where the Updates tab is located. Keep in mind that the MeeGo PR1.3 update is over 200MB in size, so you might want to connect to Wi-Fi before updating. To the author. Regarding new email not showing up. That kind of thing should work fine and is widely tested. It seems that persistent data on the phone has been corrupted. I suggest you try deleting and recreating the gmail account, and if that doesn't work do a factory reset. Why they don't keep this OS as a side-project or backup is beyond me. Elop is just a fool to load all his eggs in one basket, but I expect nothing less of a trojan.